Soup Capades Battle for The Best Winter Soup and Share their Winning Recipes! 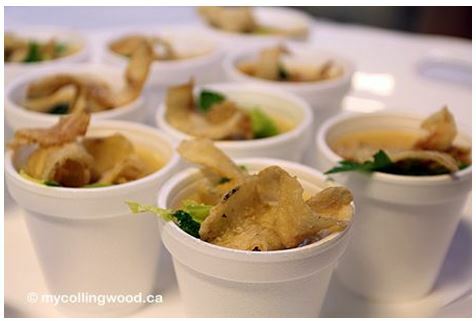 On Saturday, November 22nd, four local Collingwood chefs went head to head in the first ever Collingwood Soup Capades: battle of the winter soups. The competition was fierce, the smells were tantalizing, and the voters faced their hardest winter challenge yet: picking a winner! The votes have been tallied, and we have not one but two winners, tied for first place. 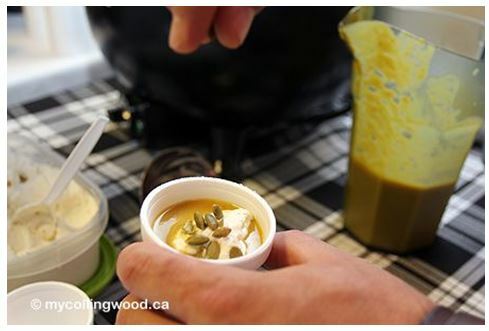 Congratulations to Travis Barron of Northwinds Brewhouse with his sumptuous Parsnip & Honey Soup, and Justin Miller of Cabin Bistro with a decadent Pumpkin Bisque. A big thank you goes out to Let’s Eat! Collingwood and everyone who participated in the event. Travis Barron moved to Blue Mountain 6 years ago to get into the food scene with Oliver & Bonacini. He started as Senior Sous Chef in 2009 and moved on to Chef of Catering, events, and weddings. He joined the Northwinds Brewhouse team in May of 2014 and has been part of that wonderful local concept. Sample his fare any night of the week at 499 First Street. Justin Miller is a Red Seal chef, a universally recognized and prestigious certification of apprenticeship in Canada. Justin has worked in some of the top restaurants in Toronto. After running “Tundra Restaurant,” located in the Hilton Toronto, he fell in love with Canadian cuisine and decided to open his own bistro in Collingwood!